As the oldest graduate fellowship of its kind, the GRFP has a long history of selecting recipients who achieve high levels of success in their future academic and professional careers. The reputation of the GRFP follows recipients and often helps them become life-long leaders that contribute significantly to both scientific innovation and teaching. Past fellows include numerous Nobel Prize winners, U.S. Secretary of Energy, Steven Chu, Google founder, Sergey Brin and Freakonomics co-author, Steven Levitt. NSF Fellows are anticipated to become knowledge experts who can contribute significantly to research, teaching, and innovations in science and engineering. These individuals are crucial to maintaining and advancing the nation's technological infrastructure and national security as well as contributing to the economic well-being of society at large. So that the nation can build fully upon the strength and creativity of a diverse society, the Foundation welcomes applications from all qualified individuals. Women, under-represented minorities and people with disabilities are encouraged to apply. The fellowship is competitive, and those planning to apply should devote a sincere effort to their application. See the How to Apply section for more information. The National Science Foundation (NSF) Graduate Research Fellowship Program (GRFP) is the country’s oldest fellowship program that directly supports graduate students in various STEM (Science, Technology, Engineering and Mathematics) fields. In March 1951, Alan T. Waterman, the chief scientist at the Office of Naval Research, was appointed by President Truman to become the first Director of the National Science Foundation. Waterman defined the Foundation’s policy role as “one of advocating a research support program, improving government-university relations, and compiling reliable information on scientific research and manpower.” In 1951, Congress appropriated only $151,000 for the agency to start administrative operations. Very early on, the Foundation created the Division of Graduate Education (DGE) to be responsible for fellowships and scholarships for graduate students and postdoctoral scientists. The GRFP was established early in the foundation's history, to encourage the best basic research and ensure a comprehensive research program. Since 1952, NSF has funded over 50,000 Graduate Research Fellowships out of more than 500,000 applicants. Currently, 42 Fellows have gone on to become Nobel laureates, and more than 450 have become members of the National Academy of Sciences. In addition, the Graduate Research Fellowship Program has a high rate of doctorate degree completion, with more than 70 percent of students completing their doctorates within 11 years. Learn more about the history of the National Science Foundation. 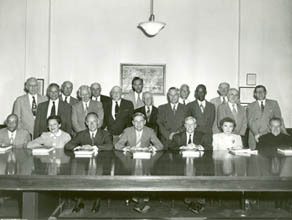 National Science Board Members, July 1951. Standing Row: Dr. Marston Morse, Dr. E.C. Stakman, Dr. Chester I. Barnard, Dr. Paul M. Gross, Dr. Frederick A. Middlebush, Dr. Joseph C. Morris, Dr. James A. Reyniers, Dr. O.W. Hyman, Dr. Lee A. DuBridge, Dr. Robert F. Loeb, Dr. Robert P. Barnes, Dr. George D. Humphrey, Dr. A.A. Potter, Mr. Charles Dollard. To prevent spam, please solve this simple math problem below. 8 + 7 = ?